Are You In Love With A Vampire? picks up where books about codependency leave off. It deals with energy patterns in a relationship, how and why we pull on each other for that vital life force – energy – and the seduction of the terror/excitement adrenaline high that is all to prevalent in abusive relationships. 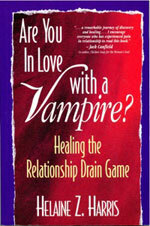 Helaine Z. Harris exposes the recent vampire craze as an emerging archetype for understanding these draining relationships. She calls this dynamic the Vampire Relationship Pattern. The good news? It can be healed. Click here to read selected chapters! Learn to center yourself in this deep-focus meditation. A guided hypnosis/medidation hybrid, in this mp3 Helaine will take you deep into your subconscious/unconscious mind and help you discover the power and energy of the Feminine Warrior within you! 50 minute runtime. This assists you in healing you rheart wounds and meeting a Heart Protector to teach you ways to protect yourself while in a love relationship. 43 minute runtime. Click here to hear a 1 minute sample! Questions or comments about products and orders? Contact us today! The San Fernando Valley, Los Angeles and LA County.